A dedicated deep fryer can be extremely useful if you are a big fan of fried food. It can save you money and be a touch healthier if you can make the perfect French fries, nuggets, and donuts in your very own kitchen. 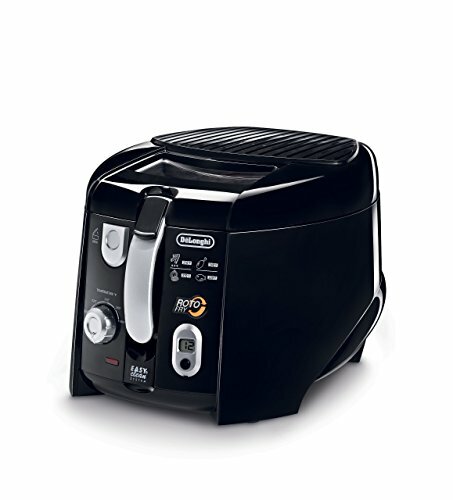 Our top pick is the Delonghi Roto Deep Fryer. Though it’s not the largest unit on our list, it packs a powerful punch and strikes the right balance between compact size and superior performance which should suit any household. Whether you’re looking for a compact model to whip up the perfect fried chicken or a larger unit to cook up fish and chips for the gang, we’ve covered the best deep fryers for home use in our reviews and model comparisons. Looking for a healthier alternative? Check out our best air fryer reviews and buyer’s guide. 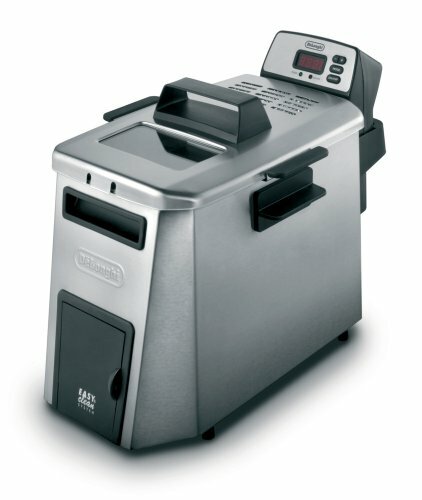 The DeLonghi deep fryer offers several unique and useful features for crisp, tasty fried foods without flavor contamination or inaccurate temperature risk. This unit uses less oil by rotating the mesh frying basket at an angle so the food is constantly being cycled from oil to air. If you prefer to change your oil often to reduce the risk of flavor contamination, this rotating design might save you money. An adjustable thermostat with indicator light makes it easy to monitor oil temperature and a clear panel on the top of the fryer gives you a great view of your food as it crisps. 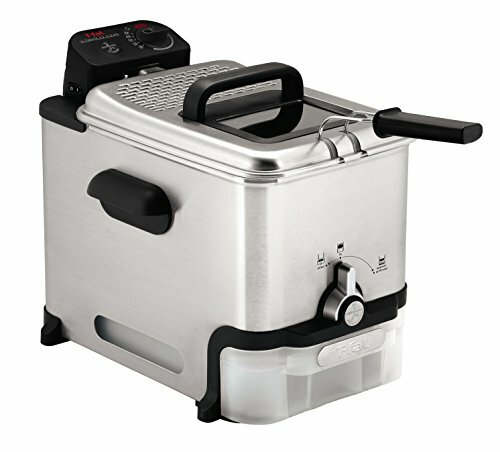 The T-Fal FR8000 deep fryer has an internal capacity of 3.5 liters (14 cups) and can hold up to 2.6 pounds of food. It has a 1700-watt immersed heating element and an internal thermostat and can be adjusted between 300 and 375 F.
The heating element is a touch on the weak side, so you might have trouble holding 375F with a full load of oil, especially right after you add a bunch of frozen food. For many households, this isn’t a big issue. While you want to hit 375F to crisp poultry skin, you’ll still get a succulent interior at much lower temperatures. Before we move on, it’s worth noting that the oil in this fryer is fairly shallow. The heating element itself goes below the fry basket, and the max fill line is perhaps 3 inches above the base of the unit. This limits you to about 2 inches of useable frying oil. For some recipes, you may find that you need to flip over food in the fry basket to cook both sides. The T-Fal is the most user-friendly deep fryer we’ve seen by far. It has all of the basics, like a two-position basket to let oil drip off of your food right into the fryer. The unit breaks down easily into separate pieces for cleanup. Everything but the heating element, power cord, and control knobs can go in the dishwasher. The power cord itself is magnetic and detachable, so you don’t risk getting hot oil all over your kitchen if someone yanks it too hard. The best feature is the oil filtration and storage system. While most other models have a spigot that dumps used oil, this T-Fal has a removable plastic bin that’s totally separate from the main frying area. When you’re done frying, oil is filtered automatically by the unit before being deposited into this removable tray. The tray itself has a pour spout to make transferring the oil to your container of choice easy. The Cuisinart CDF-100 Compact Deep Fryer has been designed for small kitchens and is ideal for individual use. The oil capacity is 1.1 liters and it holds up to ¾ pound of food. Because it’s mini-sized, the 1000-watt heating element is sufficient for your needs. It heats up quickly and, although the temperature drops when food is added, it quickly gets back up again, with a maximum temperature of 375 degrees Fahrenheit. This is a great entry-level fryer for those who want to give it a go without the expense of a full-sized unit. It takes up about as much space as your average toaster and can easily be tucked away in a cupboard when not in use. The charcoal filter fitted into the lid is highly effective, minimizing any nasty frying odors with ease. When it comes to clean up, the oil basin can’t be removed, but it’s not a big drama; there is a pouring spout to remove the used oil, and the lid and basket are dishwasher safe. Simply wipe down the basin and you’re good to go for the next round of frying. Cuisinart has thoughtfully added a little viewing window to the lid, but unfortunately, this steams up pretty easily, rendering it rather useless. Be careful when using this little unit, as the outside tends to get very hot. We greatly appreciate the break-away magnetic power cord safety feature which can prevent nasty accidents. Although this compact unit does seem to do a good job of frying small portions at a time, the “ready” light does tend to come on a little prematurely before the oil is truly at the right temperature. Give it a few extra minutes after that light flicks on before adding your food. 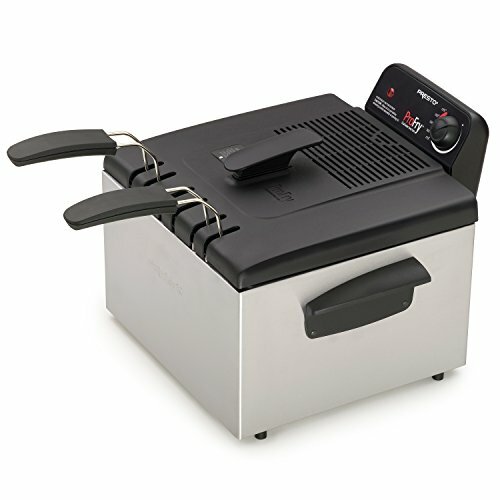 Overall, this is a nicely compact machine ideal for the now-and-then fryer or a small household of one or two people. Although Secura may be a lesser-known brand, they do a bang-up job of creating a great deep fryer. This unit is a kitchen workhorse, with 1700-watts of frying power. You’re going to need to buy your oil in bulk, as this model holds a whopping 4.2 liters (17 cups). It comes with three frying baskets: one large for doing big batches, or two smaller ones so you can fry two separate food types at once, like onion rings and chicken nuggets. All the baskets are dishwasher safe, with removable handles for easy storage. The oil tank is also removable, therefore easy to clean. There’s a carbon filter to remove unwanted odors, which does a good job, and a see-through window for you to monitor your delicious food as it fries to perfection. The thermostat is adjustable up to 375 degrees Fahrenheit and the oil heats quickly and maintains its temperature well. Although this unit can prepare a generous amount of food, it doesn’t take up too much countertop space. There is also a magnetic break-away safety cord. There is one rather annoying oversight with the Secura Triple Basket Electric Deep Fryer. The timer – which can be a handy feature on some models – is tied into the power of the machine, so when your time is up, the fryer turns off. This can be extremely annoying if you have estimated the time wrong and need to go for a bit longer or are planning to do another batch after the first and want the oil to stay hot. It’s not the end of the world, you can get around it by just setting the timer for 60 minutes to adjust for any differences. This unit is a very effective machine with a reasonable price tag. It’s ideal for large families or those who like to cook a lot of food in one go for groups of people. The Presto deep fryer can hold 5 pounds (or 12 cups) of food. It has an 1800-watt heating element that’s immersed in the oil. Both the oil pot and heating element can be removed for easy cleaning. You can get about twice as much food in this fryer as you can in the Cuisinart above, which is great if you’re cooking for a party or a large family. The 1800-watt heating element has no problems getting the oil up to higher temperatures (up to 390F!). Even with the higher capacity, the oil reheats quickly after you add food. Like the Cuisinart, this fryer has a notable lack of extra features. You’ll have to remove the oil container by hand to drain after each use. Without an on/off switch, the only way to fully power down this unit is to unplug it. The DeLonghi Roto Deep Fryer can handle 1.5 pounds of food. It has an immersed 1500-watt heating element and the internal thermostat offers temperatures between 300F and 370F. The interior is non-stick and the external walls are insulated to keep your hands safe while you’re frying. This unit has a rotating basket that allows you to nominally use half as much oil to fry the same amount of food. This doesn’t affect the performance of the unit in any way; it’s essentially the same as any other deep fryer. You might save a bit of money on oil, but this unit makes filtering and re-using oil especially easy regardless. While this fryer isn’t particularly large, it has a robust array of features that make it a solid contender for small households. Notably, it has a rubber tube on the front that can be used to filter and drain your oil after each use. You can hold your container under the spigot and have your oil clean and ready for the next use with a single button push. Other features include a digital timer, a detachable magnetic safety cord, and a replaceable odor filter to keep your kitchen stink-free. Like the T-Fal FR8000, the oil temperatures in this unit are a little lower than we’d like. The heating element has trouble maintaining 370F, especially with a rotating basket full of food. You’ll still get food up to edible temperatures, but you may have trouble getting those crispy, delectable exteriors. 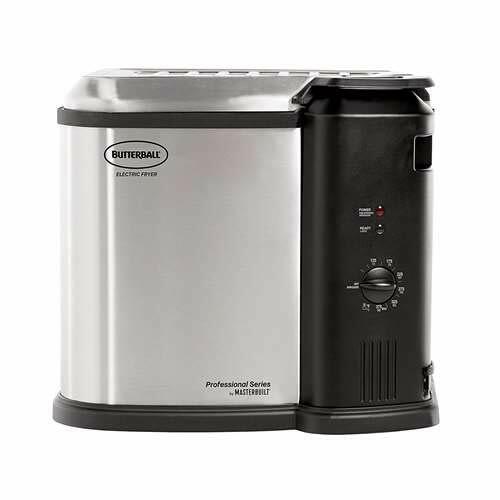 The Masterbuilt deep fryer can hold a turkey of up to 14 pounds. It has a 1650-watt heating element and offers a draining valve to make recycling your oil a bit easier. Unlike the other models on this list, this unit can be used as a steamer or a boiler as well as a fryer. The primary draw of this unit is the massive internal capacity. You’d be hard-pressed to fry a 14-pound turkey in any of the other models we reviewed, even if you cut it up into small pieces. You’ll have no problem loading the whole thing into this bad boy. The internal capacity is great for the boiling and steaming modes, too. You can cook a whole feast in this unit by layering in vegetables, seafood, and spices. If you don’t have a dedicated steamer for your kitchen, you might want to pick up this unit for those modes alone. The included filter basket makes frying a wide variety of non-turkey foods easy, and it’s simple to hang the basket over the oil after you’re done cooking to drain your food. 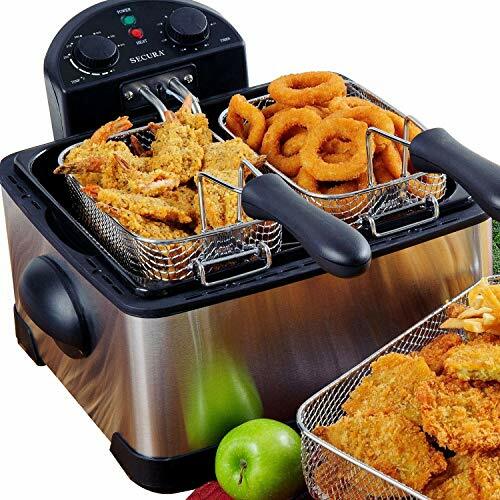 While this fryer is specially designed to deep fry turkeys, you’ll still be able to fry wings, donuts, and other foods. The 1650-watt heating element is dwarfed by the volume of oil and food that this unit can hold. You’ll need to allot a generous amount of time to preheat your oil and you may need to adjust cooking times due to the temperature drop when you add a full-size turkey (or whatever you’re frying). With the volume of oil you can use in this fryer, having an easy drainage valve is almost necessary. Luckily, there is one; while it’s a bit slow, it makes recycling the two or three gallons of oil you’ll use fairly easy. We recommend using a stool or chair to hold your container while the cold oil drips. 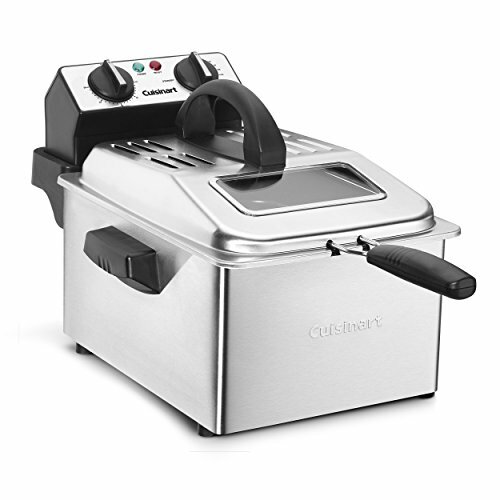 The Cuisinart CDF-200 is a 4-quart (16 cup) fryer that can handle 2.3 pounds of food. It has an immersed 1800-watt heating element and a detachable magnetic safety cord to keep your kitchen safe. The frying container is removable and has a pouring spout in one corner to help transfer oil after you’re done. The heating element on this unit is a bit more powerful than the T-Fal FR-8000. It has no problems going slightly above 375F and the oil temperature is quick to recover after you add cold food. Higher temps are crucial to get crispy skin on your poultry and in a handful of other recipes. If high temperatures are important to you, this is one of the better small fryers on the market. Like the other smaller fryers we recommend, you’ll have trouble fully immersing large items in oil with this unit. You should be fine for wings or chicken fingers, but you might have to flip over larger pieces of chicken to get them fully cooked. This unit notably lacks a number of convenient features. In order to get oil out, you have to remove the entire frying bin and pour the oil out of the spout in one corner. If you’re frying with coconut oil in a cold climate, this is a major headache. You’ll have to wait for the container and oil to cool down to safely remove the bin, but you can’t wait too long before the oil solidifies. This is a major downgrade from the side spigot included by most of the competition, not to mention the automatic filtration that T-Fal offers. While this unit gets hot fairly quickly, it’s not very well insulated. You can expect the sides to get rather hot. Manipulating the controls while you’re frying things is more comfortable with a potholder. The 1.5-liter (6 cup) capacity Oster Deep Fryer is another compact unit that is ideal for smaller kitchens. Because it has such a limited capacity, it’s really only suited for a smaller household of one or two people. 900-watts is sufficient for its size, but it does take a little longer to heat up than some of our larger, more powerful fryers. The temperature is adjustable, but there is no indicator to let you know when the oil is hot enough to start frying, so you’ll have to use a bit of guesswork. Cleaning up can be a bit awkward and may result in extra mess. This is because the oil reservoir is not removable, nor is the lid, so you have to wrangle the whole thing – lid and all – in order to drain the oil after cooking. However, the removable parts are dishwasher safe. The large viewing window is helpful for the cooking process, and the integrated filter reduces nasty frying odors. A common complaint is that the magnetic power cord is far too sensitive and disconnects very easily, you’ll need to be careful if moving this fryer around once cooking has started; the cord detaches with very little movement and you’ll lose heat quickly if this happens. 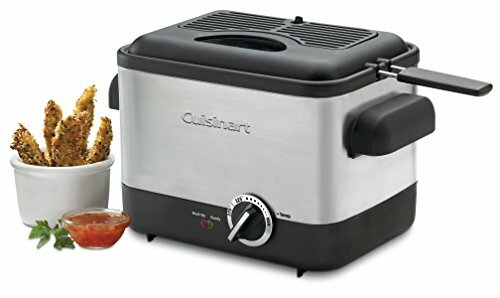 This is a passable model, but as far as compact fryers go, we prefer the Cuisinart CDF-100, which outranks this fryer due to slightly easier oil draining and the indicator light for correct temperatures. 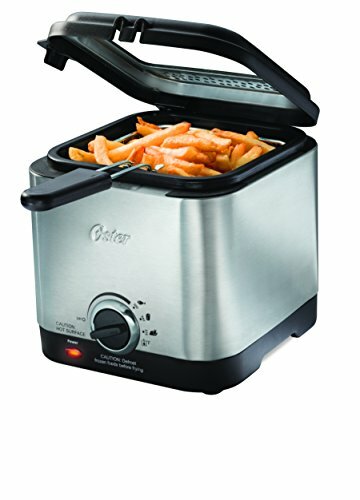 However, if you’re looking for a small model that can easily be tucked away when you’re not using it, and only need to cook for one or two people, the Oster Compact Style Deep Fryer will do a perfectly fine job. A dedicated deep fryer is handy for any home cook who deep fries on a regular basis. We think the DeLonghi Roto deep fryer is a great pick; it’s easy to clean with a tube to drain out used oil, has a powerful heating element and a handy digital timer. You’ll get better quality results thanks to an accurate thermostat reading and reduce cleanup with spatter controls available on many of the countertop units available.